A Lovely mixed country bunch of seasonal flowers, wrapped in coloured tissue paper or cello and a bow is a sure way to bring joy to mom and gran this Mothers Day! 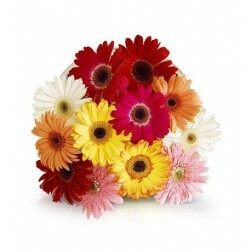 Keep it simple this Mothers Day by sending this delightful mixed bunch of bright seasonal flowers Chrysanthemums (or Daisies), lilies, roses and Gerberas wrapped in coloured tissue paper or cellophane and finished off with a bow. This mixed seasonal flower bouquet is available for same day delivery throughout South Africa.